Food Costs > How Much Do Ramen Noodles Cost? How Much Do Ramen Noodles Cost? Ramen is a noodle dish that comes in either two types: dry noodles and the soup. Ramen noodles can either be served with meat, fish or it can be a dish by itself. How much does a pack of ramen noodles cost? On average, the price of the ramen noodles will be about $0.25 to $0.45 per pack. The reason ramen noodles are so cheap when compared to other food is due to the cheaper ingredients and lightweight packaging. The necessary ingredients, as mentioned by a student on Quora will be water, wheat, flour, salt and either Kansui or eggs. All of these ingredients, when put together, are much less than the packaging price. On Amazon.com, for example, ramen noodles can cost as much as $0.52 per package. A box of 36 the Maruchan branded ramen noodles, for instance, retails for $18. At Walmart, a 12-pack of Maruchan ramen retails for $2.25, whereas a six pack of 2.25-ounce soup packages retails for a pinch less than $2. Samyang Ramen, a highly popular brand found online and at local Asian markets, is a bit pricier than the mass-produced Maruchan brand. A five pack, on average, can retail for close to $10, bringing the cost per unit to about $2 per pack. If you wanted to buy in bulk, a pallet, which may be much more than the average household could consume, could cost you close to $1,080, with 120 cases on a pallet retailing for about $9 per case. As a fun fact, the Huffington Post says with the average pack retailing for $0.14, it would only cost you $150 per year to eat ramen. Ramen noodles can come in two main forms. First, you can buy a package of dry noodles. 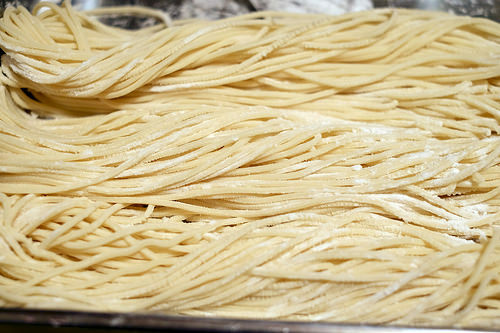 With this type, you will need to boil water and then cook the noodles. Inside the packaging, there will be a sauce packet included, which you will add to the noodles after boiling them. Depending on your preference, you can either drain the water completely, leave a small amount in, or leave a lot in to make it into soup rather than a noodle dish. The second form of ramen noodles is the microwaveable soup form. These will be slightly more expensive but are still quite cheap compared to other food items. Ramen noodles sold as the soup will come in a styrofoam cup filled with dry noodles and flavoring. This simply needs to be filled with water to the designated fill line and then put in the microwave. The container will have instructions regarding how much water and how long to cook the noodles. In addition to the different forms, ramen noodles also come in a variety of flavors. The most popular flavors you will find at your local grocery store includes chicken, chicken mushroom, creamy chicken, beef, Picante chicken, sriracha, Picante beef, roast beef, shrimp, lime shrimp, lime chili shrimp, chili and chicken tortilla. Maruchan, the most popular brand of ramen noodles at local retailers, keeps an up-to-date flavor list on its official website. Ramen noodles do have an expiration date, but it doesn’t mean you can’t consume it if the “sell by” date has passed by. In a worst-case scenario, the noodles will more than likely have a stale taste and the flavoring may be a bit different than what you’re expecting. Aside from the traditional spice packets, you can find inside the packaging, some people opt to add additional ingredients such as egg, miso broth, veggies, soy sauce, greens, meat and/or spice. While ramen can be a cheap and quick meal, it is filled with as much as 1,770 grams of sodium in one serving. This is half the recommended sodium intake for a 2,000 calorie diet. To avoid the high sodium levels, consider using healthier spices rather than the packet that comes inside the box. Vegetarians often wonder if ramen noodles are, indeed, vegan? Upon researching, the ramen noodles are made from wheat flour and oil, and oftentimes, other ingredients such as salt and additional fillers. However, this doesn’t mean the entire package is vegan-friendly. The seasoning packets, unfortunately, are not vegetarian as they can sometimes contain ingredients such as powdered chicken flavor or dehydrated beef extract. To be clear, the noodles alone are vegan free but the seasoning packets, unless you study the ingredient list for no meat related items, will not be. According to The Spruce, the Top Ramen Oriental Flavor, Top Ramen Chili Flavor and Dr. McDougall’s Ramen Noodle Cups will be vegetarian-friendly. Buy instant ramen with flavorings to avoid the cost of buying your own spices. Use alternatives like salt and pepper. This can prevent you from spending additional money on other flavor enhancers. You can save if you buy a whole box and not a single pack. Generally, the more that you purchase at one time, the more you are going to be able to save per pack. Check online for coupons from popular name brands. Dollar Trees, for instance, sells five count packages at their locations. At Walmart, the Price of Maruchan Beef Flavor Soup has jumped from $1.98 to $7.96 for a 12 pk of 3oz soups. I don’t understand the reason for the Price Gouging. This has taken place within the past month.